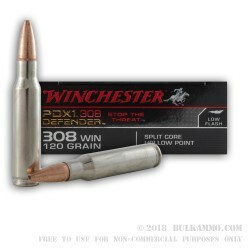 This 308 Win cartridge is from Winchester’s PDX1 Defender line of ammunition. This cartridge is specifically designed for modern sporting rifles and offers a 120 grain bullet with Split Core Technology, which features a front core engineered to provide quick impact shock and rear core welded to its jacket to provide maximum retained weight and critical penetration. The bullet’s performance is supported by its tapered copper alloy jacket, the contour of which assures optimal terminal performance. The bullet’s hollow point is protected to promote sure feeding, and quickly expands to 1.5 times its original diameter upon impact to cause great trauma. 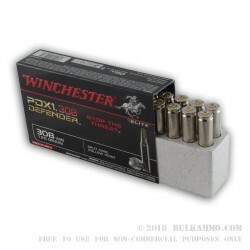 This cartridge further offers a non-corrosive Boxer primed brass casing, so you may keep 20 of them in play for a long time courtesy of a reloading bench. The round’s high quality brass casing, sensitive primer, and clean burning propellant are all indicative of Winchester’s long-standing commitment to making only excellent ammunition.